Take a close look at the picture above. The woman smizing next to Tyra Banks (who is also smizing, FYI) is Chantelle Brown-Young. She is a contestant on Cycle 21 of the long-running model competition reality show ‘America’s Next Top Model’. Chantelle is the type of women that has pretty much never been seen in the fashion and modeling world before. And herein lies our obsession with Tyra Banks, because say what you will about her, she likes to push the boundaries and has allowed her show to be a platform to change things up. So far on 20 seasons of ANTM we’ve seen ethnic girls, plus size women, a transgender model, LGBT models and even the inclusion of men recently. This season will see the first ever contestant who has a rare and incurable skin condition called Vitiligo, which destroys the cells that produce pigment in the skin. 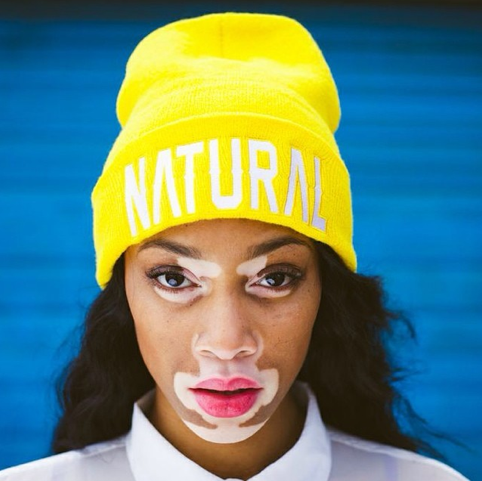 That contestant is Chantelle, who also goes by the alter-ego ‘Winnie Harlow’ (you know, like Beyonce has ‘Sasha Fierce’). There is a lot of buzz surrounding Chantelle’s appearance on the show as it will show a whole new side of what is possible in fashion, and we can all thank mother hen Tyra for that. Chantelle, originally from Canada, has been modeling for a while, but got the attention of Tyra and her production staff via Instagram. “I’d only been modeling for maybe a year before she found me, so I was pretty fresh. The fact that she wanted me so badly for her show will stick with me for the rest of my life.” It was the confidence booster she needed to keep going, and the right ingredient to make the new season of ANTM a winner even before its debut. What is so telling about having Chantelle on the show is that the fashion industry is changing and the voice of the people is getting louder and louder. There are so many campaigns these days featuring anyone other than the stock-standard Victoria’s Secret-type model, and it is showing greater representation of what real fashion customers look like. People who have vitiligo also buy clothes and love fashion (we know, shock horror) so why shouldn’t there be more models who have this skin condition showing women and men how to rock it out no matter what they look like? Chantelle is no stranger to being stared at, as it was during second grade where she realized she would never fit in. The 19 year old was bullied and teased throughout the rest of her school days, being called “cow”, “zebra” among other names. “I started to go through puberty. You’re already having changes you don’t understand, plus this skin condition that I didn’t ask for that has to do with other people’s opinions and other people’s bullying. It was tough. I definitely had problems with self-esteem,” she tells People magazine. At the age of 16 she was discovered by a photographer in her home town of Toronto and that changed a lot, including her perception of her beauty. While we are excited to see a new type of fashion role model emerging from ‘America’s Next Top Model’, Chantelle says she is wary of fans putting her up on a pedestal because of what she represents. “I definitely hope and I feel that I am inspiring, but I don’t like the word role model. I feel like people put too much on the title of a role model … you should be careful what you choose to see as a role model, whereas inspiration can come from anywhere,” she says. And indeed she will inspire many other young women to embrace the way they look, even i the world tells you you are different and don’t “fit in”. The message of unique beauty is not just something that every day non-celebrity women have to learn. You’d be surprised at how many top models today are forced to work against the stigma in the industry. One of the world’s biggest models right now is Kate Upton who is known for her bombshell curves and never ending resume. But she too has plenty to fight against when it came to her own body image. Any magazine cover she is on sells numerous copies, because she feels she is more accurately representing fashion readers, telling them you don’t have to be a size zero model to be successful or beautiful. Kate says she wasn’t always so confident, but seeing how well-received she was by the public and how inspired her body made other women feel, that helped her realize her calling. Fashion model Nikia Phoenix is another woman who has a unique look in the fashion world. 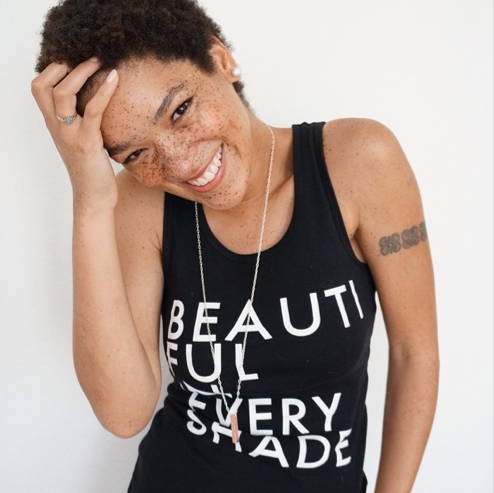 Her unique skin tone, features and freckles are stunning to look at, but she told Huffpost Style recently that discrimination still exists in the industry, which is probably why consumers are so easily accustomed to balking at someone different-looking. While she could’ve caved into the negativity, just like Chantelle could’ve listened to the bullies in her highschool growing up, Niki decided that she was enough and she didn’t have to change herself for anyone else’s standards. Her thoughts are similar to Chantelle’s and Kate Upton’s, where perfection is not the goal, acceptance is. We’re super glad there are women pushing the boundaries in such an influential industry, and for women like Tyra Banks who are fearless in their determination to set new standards of beauty. Smizing for days!